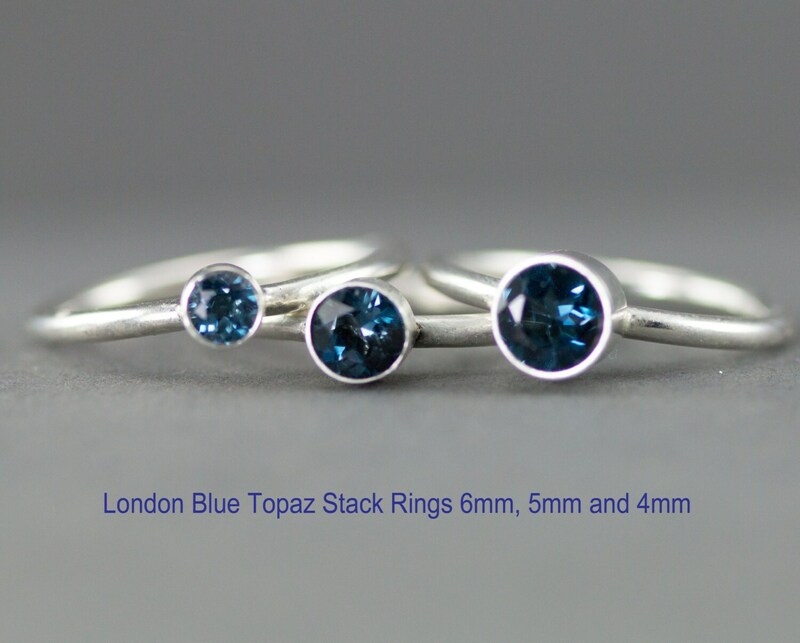 Deep ocean blue color, these London blue topaz rings come in your choice of 4 mm, 5 mm or 6mm. The sterling blue topaz stacking rings are the perfect choice as a December birthstone ring, mother's ring or just because you love blue! Each ring is bezel set as a stacking ring on a medium weight solid 1.8 mm sterling band or one of the pattern bands ranging from 2.8 - 4 mm widths. Band selections are pictured in the last photo. If you prefer a low profile ring with the setting that sits down on your finger, rather than this stackable style, with the band soldered on the sides of the setting instead of under, choose low pro in the dropdown menu, example in the next to last photo shows that style. Low profile is only done with band A! In the personalization box, write your band style by letter A-G, if A wire smooth or hammered choice, then finish- polished, oxidized or matte or leave a message in notes to seller at check out if you are using a mobile device. I will contact you for missing information. I have tried to photo the various size stones for comparison. Please note some stones have not been set, just placed in a setting to photograph.